Die Martis, 15° Maii 1832. Message to H.C. with Amendments to it. 8th Report of Tanjore Comrs delivered. 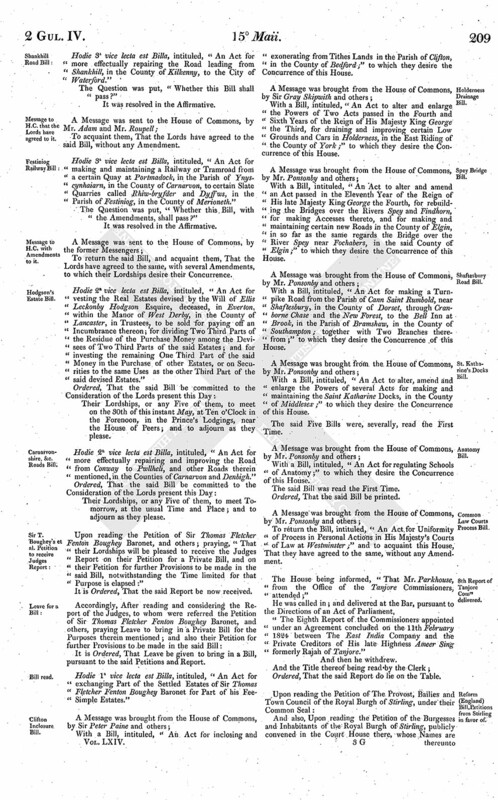 Reform (England) Bill, Petitions from Stirling in favor of. Slavery, Petition from Louth for Abolition of. Education, (Ireland,) Petition of Clergy of Diocese of Kilmore against proposed Plan. Duffus Peerage, E. Rudd's Petition respecting. Ds. Durham, C. P. S.
Hodie 3a vice lecta est Billa, intituled, "An Act for more effectually repairing the Road leading from Shankhill, in the County of Kilkenny, to the City of Waterford." Hodie 3a vice lecta est Billa, intituled, "An Act for making and maintaining a Railway or Tramroad from a certain Quay at Portmadock, in the Parish of Ynyscynhaiarn, in the County of Carnarvon, to certain Slate Quarries called Rhiw-bryfder and Dyffws, in the Parish of Festiniog, in the County of Merioneth." To return the said Bill, and acquaint them, That the Lords have agreed to the same, with several Amendments, to which their Lordships desire their Concurrence. Hodie 2a vice lecta est Billa, intituled, "An Act for vesting the Real Estates devised by the Will of Ellis Leckonby Hodgson Esquire, deceased, in Everton, within the Manor of West Derby, in the County of Lancaster, in Trustees, to be sold for paying off an Incumbrance thereon; for dividing Two Third Parts of the Residue of the Purchase Money among the Devisees of Two Third Parts of the said Estates; and for investing the remaining One Third Part of the said Money in the Purchase of other Estates, or on Securities to the same Uses as the other Third Part of the said devised Estates." Their Lordships, or any Five of them, to meet on the 30th of this instant May, at Ten o'Clock in the Forenoon, in the Prince's Lodgings, near the House of Peers; and to adjourn as they please. Hodie 2a vice lecta est Billa, intituled, "An Act for more effectually repairing and improving the Road from Conway to Pwllheli, and other Roads therein mentioned, in the Counties of Carnarvon and Denbigh." 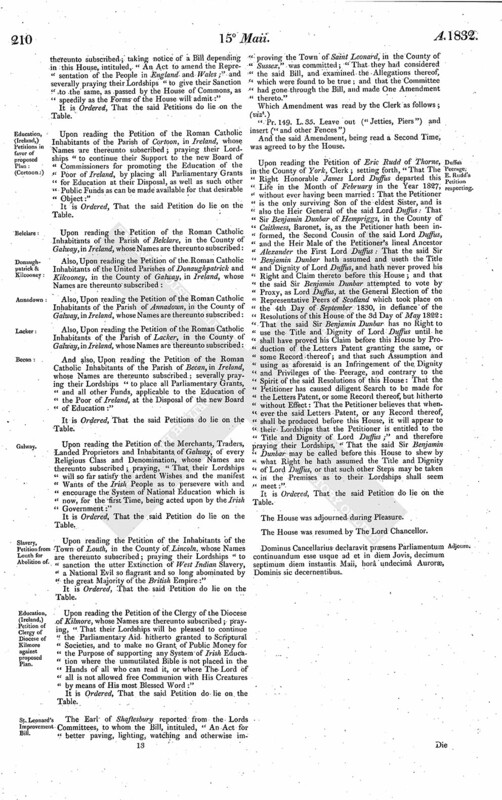 Upon reading the Petition of Sir Thomas Fletcher Fenton Boughey Baronet, and others; praying, "That their Lordships will be pleased to receive the Judges Report on their Petition for a Private Bill, and on their Petition for further Provisions to be made in the said Bill, notwithstanding the Time limited for that Purpose is elapsed:"
It is Ordered, That the said Report be now received. It is Ordered, That Leave be given to bring in a Bill, pursuant to the said Petitions and Report. Hodie 1a vice lecta est Billa, intituled, "An Act for exchanging Part of the Settled Estates of Sir Thomas Fletcher Fenton Boughey Baronet for Part of his FeeSimple Estates." With a Bill, intituled, "An Act for inclosing and exonerating from Tithes Lands in the Parish of Clifton, in the County of Bedford;" to which they desire the Concurrence of this House. With a Bill, intituled, "An Act to alter and enlarge the Powers of Two Acts passed in the Fourth and Sixth Years of the Reign of His Majesty King George the Third, for draining and improving certain Low Grounds and Cars in Holderness, in the East Riding of the County of York;" to which they desire the Concurrence of this House. With a Bill, intituled, "An Act to alter and amend an Act passed in the Eleventh Year of the Reign of His late Majesty King George the Fourth, for rebuilding the Bridges over the Rivers Spey and Findhorn, for making Acceses thereto, and for making and maintaining certain new Roads in the County of Elgin, in so far as the same regards the Bridges over the River Spey near Fochabers, in the said County of Elgin;" to which they desire the Concurrence of this House. With a Bill, intituled, "An Act for making a Turnpike Road from the Parish of Cann Saint Rumbold, near Shaftesbury, in the County of Dorset, through Cranborne Chase and the New Forest, to the Bell Inn at Brook, in the Parish of Bramshaw, in the County of Southampton; together with Two Branches therefrom;" to which they desire the Concurrence of this House. With a Bill, intituled, "An Act to alter, amend and enlarge the Powers of several Acts for making and maintaining the Saint Katharine Docks, in the County of Middlesex;" to which they desire the Concurrence of this House. The said Five Bills were, severally, read the First Time. With a Bill, intituled, "An Act for regulating Schools of Anatomy;" to which they desire the Concurrence of this House. To return the Bill, intituled, "An Act for Uniformity of Process in Personal Actions in His Majesty's Courts of Law at Westminster;" and to acquaint this House, That they have agreed to the same, without any Amendment. The House being informed, "That Mr. Parkhouse, from the Office of the Tanjore Commissioners, attended;"
"The Eighth Report of the Commissioners appointed under an Agreement concluded on the 11th February 1824 between The East India Company and the Private Creditors of His late Highness Ameer Sing formerly Rajah of Tanjore." Ordered, That the said Report do lie on the Table. 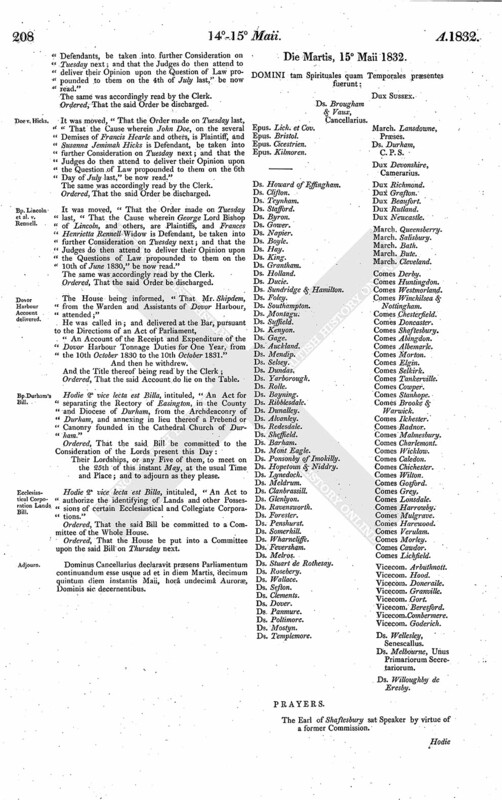 And also, Upon reading the Petition of the Burgesses and Inhabitants of the Royal Burgh of Stirling, publicly convened in the Court House there, whose Names are thereunto subscribed; taking notice of a Bill depending in this House, intituled, "An Act to amend the Representation of the People in England and Wales;" and severally praying their Lordships "to give their Sanction to the same, as passed by the House of Commons, as speedily as the Forms of the House will admit:"
Upon reading the Petition of the Roman Catholic Inhabitants of the Parish of Cortoon, in Ireland, whose Names are thereunto subscribed; praying their Lordships "to continue their Support to the new Board of Commissioners for promoting the Education of the Poor of Ireland, by placing all Parliamentary Grants for Education at their Disposal, as well as such other Public Funds as can be made available for that desirable Object:"
And also, Upon reading the Petition of the Roman Catholic Inhabitants of the Parish of Becan, in Ireland, whose Names are thereunto subscribed; severally praying their Lordships "to place all Parliamentary Grants, and all other Funds, applicable to the Education of the Poor of Ireland, at the Disposal of the new Board of Education:"
Upon reading the Petition of the Merchants, Traders, Landed Proprietors and Inhabitants of Galway, of every Religious Class and Denomination, whose Names are thereunto subscribed; praying, "That their Lordships will so far satisfy the ardent Wishes and the manifest Wants of the Irish People as to persevere with and encourage the System of National Education which is now, for the first Time, being acted upon by the Irish Government:"
Upon reading the Petition of the Inhabitants of the Town of Louth, in the County of Lincoln, whose Names are thereunto subscribed; praying their Lordships "to sanction the utter Extinction of West Indian Slavery, a National Evil so flagrant and so long abominated by the great Majority of the British Empire:"
Upon reading the Petition of the Clergy of the Diocese of Kilmore, whose Names are thereunto subscribed; praying, "That their Lordships will be pleased to continue the Parliamentary Aid hitherto granted to Scriptural Societies, and to make no Grant of Public Money for the Purpose of supporting any System of Irish Education where the unmutilated Bible is not placed in the Hands of all who can read it, or where The Lord of all is not allowed free Communion with His Creatures by means of His most Blessed Word:"
The Earl of Shaftesbury reported from the Lords Committees, to whom the Bill, intituled, "An Act for better paving, lighting, watching and otherwise improving the Town of Saint Leonard, in the County of Sussex," was committed; "That they had considered the said Bill, and examined the Allegations thereof, which were found to be true; and that the Committee had gone through the Bill, and made One Amendment thereto." And the said Amendment, being read a Second Time, was agreed to by the House. Upon reading the Petition of Eric Rudd of Thorne, in the County of York, Clerk; setting forth, "That The Right Honorable James Lord Duffus departed this Life in the Month of February in the Year 1827, without ever having been married: That the Petitioner is the only surviving Son of the eldest Sister, and is also the Heir General of the said Lord Duffus: That Sir Benjamin Dunbar of Hempriggs, in the County of Caithness, Baronet, is, as the Petitioner hath been informed, the Second Cousin of the said Lord Duffus, and the Heir Male of the Petitioner's lineal Ancestor Alexander the First Lord Duffus: That the said Sir Benjamin Dunbar hath assumed and useth the Title and Dignity of Lord Duffus, and hath never proved his Right and Claim thereto before this House; and that the said Sir Benjamin Dunbar attempted to vote by Proxy, as Lord Duffus, at the General Election of the Representative Peers of Scotland which took place on the 4th Day of September 1830, in defiance of the Resolutions of this House of the 3d Day of May 1822: That the said Sir Benjamin Dunbar has no Right to use the Title and Dignity of Lord Duffus until he shall have proved his Claim before this House by Production of the Letters Patent granting the same, or some Record thereof; and that such Assumption and using as aforesaid is an Infringement of the Dignity and Privileges of the Peerage, and contrary to the Spirit of the said Resolutions of this House: That the Petitioner has caused diligent Search to be made for the Letters Patent, or some Record thereof, but hitherto without Effect: That the Petitioner believes that whenever the said Letters Patent, or any Record thereof, shall be produced before this House, it will appear to their Lordships that the Petitioner is entitled to the Title and Dignity of Lord Duffus;" and therefore praying their Lordships, "That the said Sir Benjamin Dunbar may be called before this House to shew by what Right he hath assumed the Title and Dignity of Lord Duffus, or that such other Steps may be taken in the Premises as to their Lordships shall seem meet:"
Dominus Cancellarius declaravit præsens Parliamentum continuandum esse usque ad et in diem Jovis, decimum septimum diem instantis Maii, horâ undecimâ Auroræ, Dominis sic decernentibus.